Let me start with an embarrassing memory. Growing up one time, I wanted to watch Home Alone with my dad. I had to go grab something so he told me not to be too long so I wouldn’t miss much. I don’t think he was too interested in watching the movie, and I remember taking longer than a minute to retrieve whatever it was I needed, and we watched the rest of the movie. I’ll always remember that when I see any Home Alone VHS tapes. It’s weird how the blues and distinctive cover always take me back to that location and memory. Since it was probably my favorite movie at the time, and I’d seen it more than a few times, were it not for that cringy feeling of having done something embarrassing, I’d consider a recurring memory like that to be a positive one. That’s one tape that didn’t make the cut. If I ever regret this decision, I could just look up a picture of the tape for that memory. The memory isn’t tied to anything innate to that specific object. It had no distinct wear. I don’t remember writing my name on it while waiting for a school bus before my first day of third grade, or anything like that, so something like that can go. Some of the tapes in those 7 boxes have more tangible memories. The thrift store where I donated those two boxes of VHS tapes today had a tape of Daens a curious sticker, last year, which led me on a journalistic voyage through Seattle. I was in search of two video rental stores: one closing and another thriving. I still haven’t watched Daens, but a tape like that can evoke that spirit of adventure. Others, like Godzilla tapes, just have cool murals. Or mild curiosities that never were interesting. One value of collecting up my entire VHS collection like this, in preparation for months of deep storage, is for instances like what happened today. After donating those tapes, I looked around for more stuff and found Son of Godzilla. Not because I’d have to rebox everything. It’s just… the mural’s online. 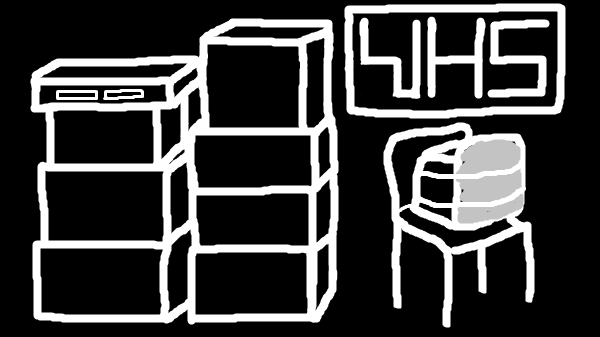 Picture: Drawing of my collection, with a chair for the television, because that should be its stand. Last Edited: No additional edits. [Sober Living] Jetlag… or More?